I want to connect an input and output audio line signal of two different devices. The earth potential of their audio connectors is might be floating, connected to mains earth, or offset by some DC or AC amount, with some resistance and other complications - the usual real-life audio stuff. I'd rather not use audio transformers if this will do. AC mains is a audio frequency so capacitors large enought to pass audio will not effectively block AC hum. use an audio isolating transformer instead. Small transformers are available for line level signals, and larger ones for loudspeaker signals. isolation is no needed between a floating and a fixed device unless the floating device must stay floating. No, your circuit won't work as expected. 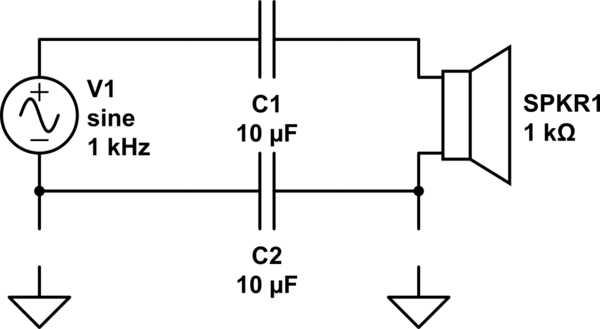 The capacitor in the audio ground is connected to the two grounds so if they are at different DC potentials it will simply charge up and stay there at that potential difference, with no current flowing. Which tells us the real answer; if both audio circuits are grounded and the grounds may be offset, just disconnect the audio return wire with a "ground lift" switch. Note, it is not safe to disconnect an actual circuit/safety ground, just the audio ground connection between the two. So then you just have one wire carrying the signal, with a capacitor in it. In other words, just avoid a ground loop by not connecting the two grounds together. Not the answer you're looking for? Browse other questions tagged audio groundloops or ask your own question. Audio transformer: What to do with an unused winding?